On June 8, it will be 60 years since the electoral farce that led General Humberto Delgado to the polls. Maio de 58, by António Torrado, is a text on this subject, with a staged reading by Castro Guedes, based on “Translational Theatre”, in which the audience is invited to challenge the reality freely in temporal spaces determined by the director and the actors. Maio de 58 (May of 58) Text by António Torrado. 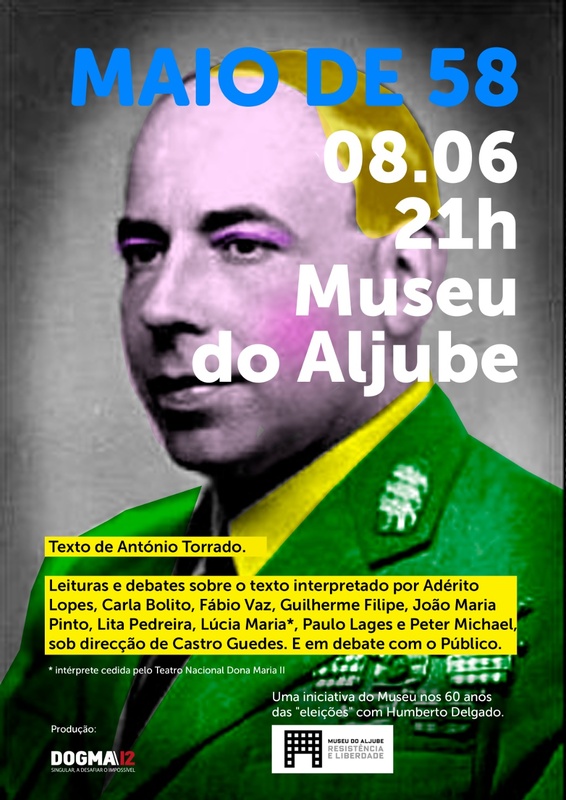 Readings and debates about the text interpreted by Adérie Lopes, Carla Bolito, Fábio Vaz, Guilherme Filipe, João Maria Pinto, Lita Pedreira, Lúcia Maria*, Paulo Lages and Peter Michael under the direction of Castro Guedes. And debate with the audience. *interpreter provided by the National Theatre Dona Maria II An initiative of the Museum to mark the 60 years after the “elections” with Humberto Delgado. Free admission, with prior appointment at the Educational Service of the Museum.